How is marijuana still an issue in 2018? Oh wait, because Virginia. Unlike, San Francisco and other localities all through the US who are decriminalizing marijuana, Virginia just killed a bill to decriminalize small amounts of marijuana in committee. Earlier this week, nine Republicans who sit on the Senate Courts of Justice Committee voted against the measure in a vote that was cast along partisan lines. The bill, sponsored by Senator Adam Ebbin (D-30th District), would have revised the punishment for possession from a criminal misdemeanor to a civil penalty. California voted to legalize marijuana in November 2016, after the Proposition 64 referendum which passed with 57 percent of the vote – legalization went into effect as of January this year. Norment reversed his position this past week, citing that the bill would likely never make it out of committee. Nonetheless, Virginia’s State Crime Commission released a report last October finding that current marijuana laws disproportionately target black communities – and that research into decriminalization in the Commonwealth is outdated – focusing mainly on medicinal research such as that done by the Joint Commission on Health Care. Which is another part of the long-standing issue surrounding decriminalization legislation. Yet according to Jenn Michelle Pedini, the Executive Director for the National Organization for the Reform of Marijuana Laws (NORML) in Virginia, eight out of ten Virginians support “fines not crimes” for possession of marijuana by adults. “It’s time for our state legislature and Commonwealth’s Attorneys to reflect the will of those they were elected to represent, and not simply their own profit structures,” stated Pedini when asked by RVA Mag what the difference between Virginia and California really was when assessing decriminalization. Virginia will continue to exist in a purgatorial no man’s land with regards to decriminalization. As a result, the trend of arresting and incarcerating first-time marijuana users will likely continue for the time being. Indeed, the State Crime Commission found that 133,000 people were arrested on marijuana charges in the last decade alone, making Virginia one of the leading states for marijuana arrests. Could this be the Year for a Medical Marijuana Breakthrough in Virginia? 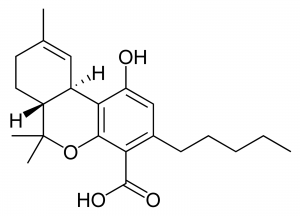 Senate Bill 726 is a “doctor’s decide” bill, meaning that physicians in the Commonwealth will be able to recommend the use of cannabidiol oil or THC-A oil to treat or alleviate the symptoms of any diagnosed condition or disease determined by the practitioner to benefit from such use. 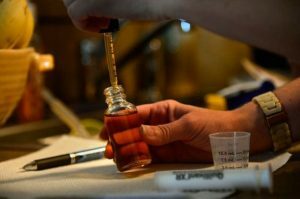 “This would expand patient access to extraction-based cannabis medicines that will meet the need of Virginia’s most critically ill patients — as well as those suffering from everyday conditions like arthritis,” said Pedini. This bill is more likely to be successful than efforts in the past because it was originated through the committee process, and has been shepherded by a Republican doctor, Senator Siobhan Dunnavant. Last year, Gov. 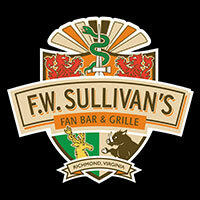 McAuliffe signed into law legislation to allow the licensing of five pharmaceutical processors — one per health service area in the state — which will produce medical cannabis oils. “These facilities will look more like a CVS than a Colorado dispensary,” said Pedini. SB 726’s companion bill in the House, HB 1251, unanimously passed through subcommittee today, clearing what might have been its most substantial hurdle on its path to being law. And there is increasing evidence that marijuana is actually a “step down” drug that could prove a major force in combating the Commonwealth’s opioid epidemic. 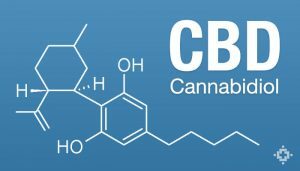 Medical cannabis legalization leads to a substantial drop in opioid-related hospital visits, reported the Department of Family Medicine and Public Health at the University of California San Diego. Advocates for marijuana decriminalization were let down when Senate Majority leader Tommy Norment — who previously had voiced support for decriminalization — instead introduced an expungement bill. The public sentiment on the issue is clear: the Commonwealth wants marijuana reform. Recently the Virginia Crime Commission solicited citizen feedback on the issue. Staff received over 5,665 written comments, of which 3,743 supported decriminalization and 107 did not. 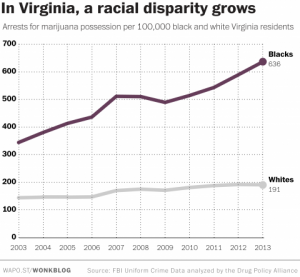 The racial disparity in marijuana-related arrests in Virginia is alarming. “Males, young adults, and Blacks are over-represented in the total number of arrests for possession as compared to their overall general population in Virginia,” cited the nonpartisan Crime Commission report. While whites and blacks use marijuana at similar rates, in Virginia blacks are charged at a rate of over 3-to-1. In some parts of Virginia, that ratio is 11-to-1. All marijuana-related bills pass through the Courts of Justice Committees. From there they would head to the House and Senate for votes, and then to the desk of newly inaugurated Gov. Ralph Northam, who has previously stated his support for doctor-recommended medical cannabis. “Marijuana decriminalization is a racial justice issue,” Dr. Northam has stated. During the 2018 General Assembly session — which runs from January 10 to March 10 — legislators will vote on thousands of bills. They rely on feedback from constituents to determine their votes. “If people want to support this, use the Virginia NORML email action alert, and pick up the phone and call your elected officials,” said Pedini. Radio IQ is pretty amazing – they are central VA’s on 24 news/talk public radio station and they have some great success with local news. The 2015 General Assembly started off with a bang today as a bill hoping to decriminalize small amounts of pot was deferred to another meeting and NOT killed.